4 What Are Other Reviews Saying about the Nautilus R614C? 5 Any Issues with the Nautilus R618 Review? Upgraded for this year the Nautilus R616 has quickly established itself as a favorite with consumers. You might be surprised to see Nautilus as a cardio brand, I am more used to seeing their strength equipment. However the have managed to pull out a great bike, packed with features at a great cost! 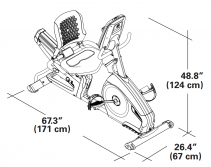 In common with all recumbents the Nautilus R616 is sublimely comfortable. The laid back riding position completely removes any pressure on the lower back and legs. I can ride these bikes for hours and finish in much better shape than I would on an upright. 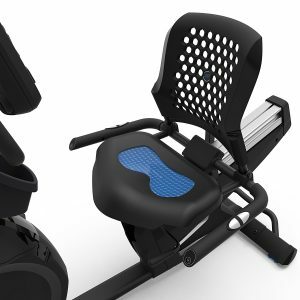 With its good supportive seat that is easily adjusted to suit the riders height, and large pedals this is more like sitting in an armchair! There is a degree of self assembly required with this bike. Don’t panic though, the instructions are written in plain english, and if you are OK with your hands it will be ready in an hour. ls turning smoothly and you will enjoy the natural feel of the bike as you turn the pedals. There is a generous number of pre installed programs with this bike. At 22 it is more than most of its competitors. They include hill climbs, Heart rate controlled programs, a quick start, fitness test, distance test and calories. These will ensure that you are motivated to keep coming back to the bike, and you can watch your progress improve over time. The programs are all available through the computer console. 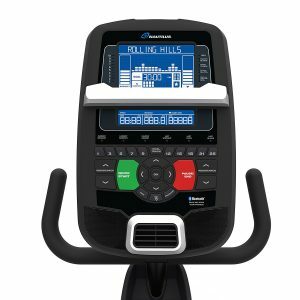 This is fairly standard and provides all the data you need to monitor your performance, and that of a workout partner: including number of calories burned, resistance, speed, pulse, distance, watts, RPM, interval time and time. 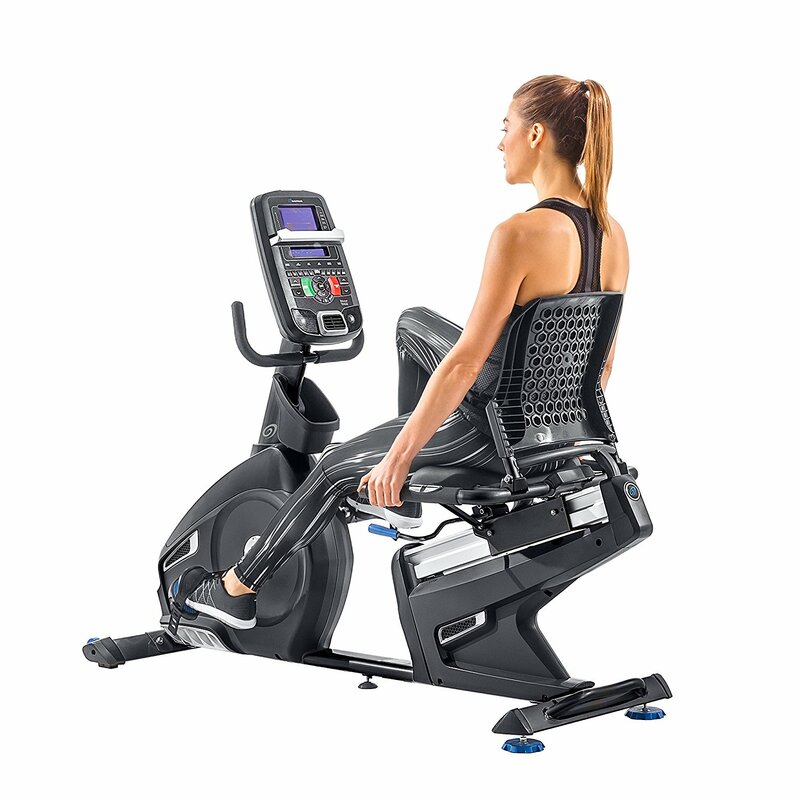 Each set of results can be stored under two users, so its great if you have a couple of people using the bike. You can select 16 levels of resistance with the R614. It ranges as you might expect from a gentle free wheel to a full on lung busting hill climb. All the levels are set via the console on nice clear controls. Fan: A good usable three speed fan can direct air to your face or your legs. This is great as your legs start to warm up you can move the air current about. This is the only bike that I have seen at this level that offers this feature and really like it. Bottle Holder: There is a convenient bottle holder mounted under the console, so there is no risk of spilling anything over the electrics. iPad Holder: Above the console is a bracket where you can secure a tablet computer. Great for watching movies while you exercise. Nautilus must be very confident that this bike will perform well! With the R618 there is a colossal 15 years on the frame, 2 years on mechanical parts, 3 years on electric parts, and 12 months on wear parts. That should give you the confidence that this will last for years. What Are Other Reviews Saying about the Nautilus R614C? Any Issues with the Nautilus R618 Review? None really, at this price, less than $800 you are getting a very solid performer. The only slight issue was one reviewer who wanted to see more improvement over the original version of this bike. For us though we love the huge number of features, and great feel of build quality that Nautilus have packed in tot he price. Modern, great looking and a joy to use.